I am back with another Monday Reviews! This week, thanks to Raincoast Books, I am reviewing my advanced copy of Teen Frankenstein by Chandler Baker. All opinions are my own. Anyways, after a few weeks, "Adam" (you know, like first male human, Adam-and-Eve Adam) starts experiencing issues, and violent streaks, and several people from the town go missing and turn up dead and mutilated. Number one suspect is Adam. 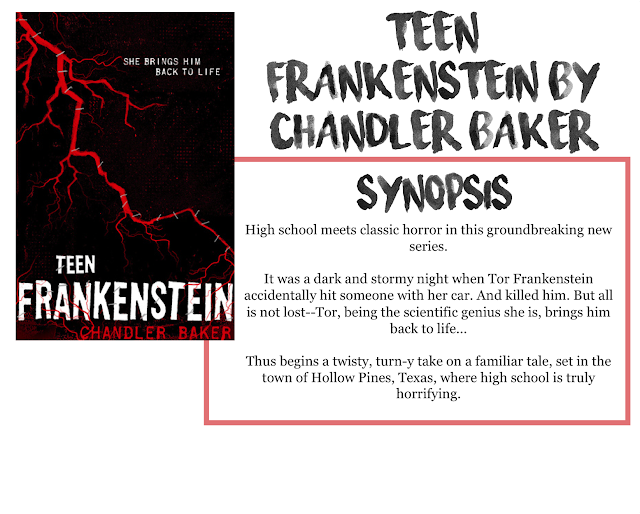 Long story short, this is an intense, weird tale that I think you would enjoy if you like science stuff, Frankenstein, or just a weird, creepy read. I'm too into science, most of the more advanced stuff kinda went right over my head... but I still liked it. It was part murder-mystery-in-a-small-town part not-so-evil-evil-scientist. The end is wrapped up, but there is definitely more to the story, hence the opportunity for a sequel. I don't think everyone will love this book, but it's definitely interesting for those that want to take a swing! Definitely check it out, its published January 12, 2016!